How Would You Dress Up a Drab Quilt? » What's Under the Needle? home » Quilting Workshops in 2018 » How Would You Dress Up a Drab Quilt? How Would You Dress Up a Drab Quilt? Have you ever made a quilt that you wish had just that bit more... it isn't doing it for you or you feel something is missing? I think every quilter has at least one quilt like that. So what do you do about it? Here's an idea that might shock you. How about adding a Ghost Image? No not an image of a ghost, but rather an impression of some object. 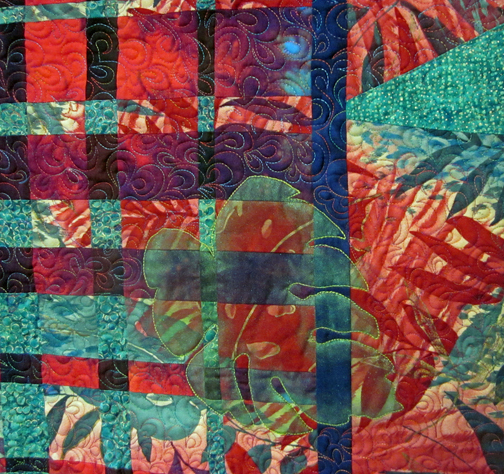 Daphne has done just that with this piece... can you see her leaf that she added over the top of her finished quilt? But how did she do it? You might think she used a sheer fabric... but no, she used a freezer paper template and Paintstiks. Want to find out more about this fabulous online workshop?